Go see this movie. Go see this movie if you like thrillers, if you like character development, if you like suspense, if you like cinematography, if you like George Clooney, if you like Sandra Bullock, and if you like Alfonso Cuaron, director of “Children of Men” and “Y Tu Mama Tambien” Go. See. This. Movie. 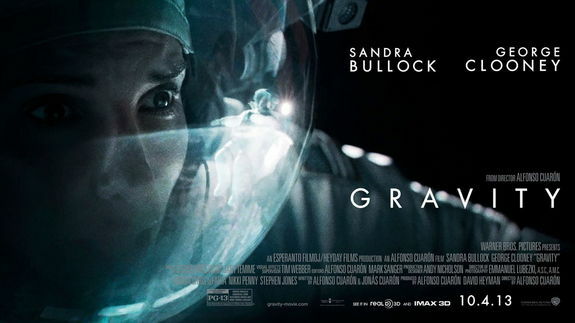 Gravity stars Sandra Bullock as Dr. Ryan Stone who is up in space on her first mission alongside commander Matt Kowalski, played by George Clooney, who is equal parts light-hearted and concern. Ed Harris, IMDB informed me of this, did the voice for Houston: Mission Control in this film and is worth mentioning because I didn’t know this. While up in space, Dr. Stone is a raw nerve held together by work. She is up there to complete a task, not to make any friends along the way. While uploading a new program to the Hubble telescope, Stone and Kowalski are informed by Mission Control to get back to the International Space Station because Russia has detonated a series of satellites, the debris of which is heading directly towards them. The rest of this movie is profound and edge of your seat terrifying. I had the pleasure of seeing this film in 3-D and it was completely worth it. My God. I was immersed in it. This was due in part to the 3-D but mostly due to Mr. Cuaron. Seriously. The lack of sound in precise moments, the use of first person point-of-view, made it seem like you were right up there with them. The length of his shots were really what stood out in this film. I don’t know how long the first shot is, but it is long, and it give the viewer a glimpse into the vastness of space as well as the characters that are bouncing around in it. Just astounding. Sandra Bullock was excellent in this film and if she doesn’t walk away with an Oscar then the person who beat her to it better be astounding. She was unlike anything I have ever seen from her before. It was mostly her within this film which made her performance that much greater. It was just you and her. You experienced every bump, every anxiety, every chance of hope, right alongside her. George Clooney appeared at home in this film, like he truly was Commander Kowalski who had a slew of stories up his sleeve but was read to become exacting at a moment’s notice. This film was absolutely everything anyone said it would be. It was a simple and short story but it was powerful. Go see it for yourself and tell me otherwise if you truly feel different.